n a widening of the periodontal space between the periodontal ligament and the root of a tooth that indicates the presence of periodontal disease, possibly that of trauma or infection. This shows up on radiographs as a thick radiolucent line next to the root. n the angle formed between the blade of an instrument and a tooth or tissue to provide increased access and more effective treatment. n the proper angle to take a periapical survey radiograph using the bisecting angle technique. 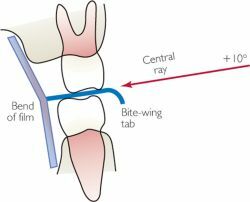 Horizontally angled so that the ray passes through the interproximal space as close to the center of the area being radiographed as possible, and vertically angled so that the ray travels perpendicular to the bisection of the angle formed by the film and the long axes of the targeted teeth. n the correct angle at which the polisher's handpiece must be positioned in order to reduce the backflow of aerosol spray during treatment. The position varies according to tooth position and surface. n the angle measured within the occlusal plane at which the central ray of the radiographic beam is projected relative to a reference point in the vertical or sagittal plane. n the proper angle to take a mandibular midline radiograph. The position-indicating device should be pointed at the end of the chin at a 55° angle to the film for a view of the incisal region. To view the floor of the oral cavity, the position-indicating device should be perpendicular to the film, directly below the chin. n the proper angle to take a maxillary midline radiograph. The position-indicating device should be aimed at a +65° angle at the bridge of the nose. n the horizontal and vertical angles at which the central ray is aimed. Too much horizontal angulation causes superimposed images, while too much vertical angulation causes foreshortening. Also, too little vertical angulation causes elongation of the image. n the technique that gives the proper angle for taking a periapical radiograph using the paralleling technique. The central ray should be directed through the interproximal area roughly at the center of the film while the vertical angle should be at a precise right angle to the film. This is sometimes preferable because, unlike the bisecting angle technique, no radiographs are directed at the thyroid. Instrumental angulation. A, Ideal initial placement. B, Too close to effectively remove calculus. C, Ideal for debridement. D, Too open. 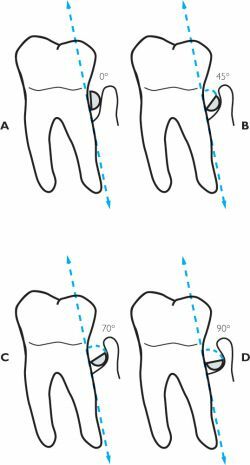 n the angle measured within the vertical plane at which the central ray of the radiographic beam is projected relative to a reference in the horizontal or occlusal plane.